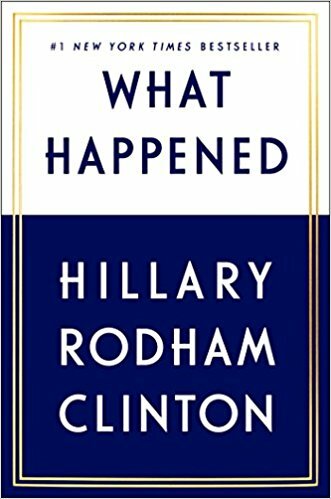 The autobiography entitled �What Happened� by Hillary Clinton serves as a reflection of her experiences during the 2016 election in which she was electorally defeated at the hands of the politically inexperienced candidate, Donald Trump. This book is not an easy read, and in some parts becomes unbearably cringeworthy as Clinton sways in the limbo of describing what happened, and moving on from her failed endeavors. From a political standpoint, unless Clinton decides to run again in 2020, this book is utterly useless. It has no substance, no insight into relevant political gossip and no gripping untold political storyline. �What Happened� merely details Hillary�s carefully filtered inner thoughts about her campaign and post-election reaction. The purpose of Clinton writing this book is to appeal to the American public; something that, as a flaming liberal, I�m honestly tired of hearing. We�ll discuss whatever takeaways exist in the book and if it�s worth your time reading. Clinton begins her introductory chapter at the presidential inauguration of Donald Trump and tells of how she begrudgingly attended the ceremony because she �felt a responsibility to be there� (p.4). At face value, Clinton�s attendance at the inauguration could be described as admirable and that maybe she had moved on from the presidential loss. Not so fast. The emotional tone in the book shows, that in January when she attended the inauguration, she wasn�t over it, and 8 months later in September when this book was published, she still felt compelled to include her ostentatious behavior and thoughts of the time. We see this through Clinton�s exasperating pity party when she describes how several politicians including the Bushes and John McCain came to console her for the loss. She then unfurls her disdain toward Trump by calling out his strategic use of the media which Clinton claimed he used to manipulate the American public. Although accurate, these shots at Trump repeat throughout the chapter, and they reek of emotional despair, instead of their intended use of showcasing Trump�s villainy. Her emotional recount of that inauguration paints Clinton as an estranged teenage girl who just went through a breakup. In this case, it�s an experienced and internationally recognized politician who was just rejected by the American public for a second time. She�s hurt in this introductory chapter, and it shows. She begins the chapter by �taking one for the team� by attending the inauguration, and ends with taking parting shots at Trump�s Interior Secretary Ryan Zinke, and Utah Congressman Jason Chaffetz, who Clinton jokingly thought was Reince Priebus. Clinton�s behavior, and description of the events at the inauguration exaggerates her desire to be admired by the American voter. This is seen through her thoughts on the middle class where she says �The American middle class really had gotten screwed. The financial crash of 2008-2009 cost them jobs and ripped away their security�� (p.8). It feels like she�s still on the campaign trail in this book, and the pursuit of voter affection continues into her chapter titled �Frustration� in which Clinton campaigned in a strong Republican district in West Virginia. Clinton begins by talking about a comment she made during her campaign that was taken out of context. The comment was �We�re going to put a lot of coal miners and coal companies out of business�, but Clinton defends this by saying her full comment was in response to a question about how she would win support from working-class whites who typically vote Republican. The actual comment was, �I�m the only candidate who has a policy about how to bring economic opportunity using clean renewable energy as the key into Coal Country. Because we�re going to put a lot of coal miners and coal companies out of business, right Tim? And we�re going to make it clear that we don�t want to forget those people� (p. 264). This misconstrued comment arched the backs of Republican voters in West Virginia who indeed are coal miners. As a response, Clinton wanted to address them directly and against the advice of her campaign, traveled to Mingo County, West Virginia which Clinton labeled as �Ground Zero for the coal crisis.� Deep in a Republican held county, Clinton believed she could mend some of the hearts of these angry coal miners. Clinton asserts in this chapter that she has always been a friend of West Virginians and coal miners in general; again, trying to further broaden her appeal to the American voter. According to Clinton, �When I launched my campaign for President� I specifically mentioned Coal Country and the need to help distressed communities�no other candidate came close to this level of attention to the real challenges facing coal communities� (p. 269-270). When we analyze these couple of quotes more in depth, a deeper political motive emerges. Throughout some parts of America, the consensus exists that Democrats represent the political ideals of latte sipping, coastal hipsters. This has been somewhat of a knock not just on Hillary Clinton, but on the DNC overall. In this �Frustration� chapter, Hillary challenges this outlook by saying �I�m a candidate for all Americans� I�ve been the candidate looking out for coal country since day 1.� The fact that the people in Mingo county wanted nothing to do with Clinton probably accentuates this theme of �Frustration� on her part. As Clinton claims, �I knew I wouldn�t get a warm welcome in West Virginia. That was the point of my visit, after all. But this level of anger took me aback� (p. 273). The visit to Mingo county to attempt to appeal to white coal mining Republicans reverberates back to her desire to be admired by ALL of America. A consistent knock on her campaign post-election was that she didn�t address these voters. Hillary�s response to this assertion comes in this book, and specifically in this chapter, where she essentially says, �Hey, see what I did for these people? I�ve been talking about bringing opportunity to these areas for years. You can�t hold that against me.� This is just another example of the sad, desperate and unsettled portrait that Clinton paints of herself in this book. In reality, Mingo county was not the focal point of Clinton�s campaign. The campaign slogan �I�m With Her� does not scream �I support coal miners!� Hillary may have had coal miner�s interest somewhere in her heart, but at the foreground her platform was a blend of the continuation of Obama administration policies and of the Democratic Socialism advertised in the campaign of Senator Bernie Sanders. Hillary Clinton lost the election, plain and simple. One crucial goal in this book was to illustrate how she has moved on from her dramatic political upset, but the fact that she wrote �What Happened� in the first place only means that her heart�s stuck in 2016. Looking for the George W. Bush book of the same name?